Free, public Wi-Fi access points are popping up in more and more places around the world. They’re extra useful when travelling, as you won’t have your home Wi-Fi network and may not want to pay for international mobile data. These tips will help you find Wi-Fi hotspots on the go, whether you’re travelling to a foreign country or just to the other side of your home city. 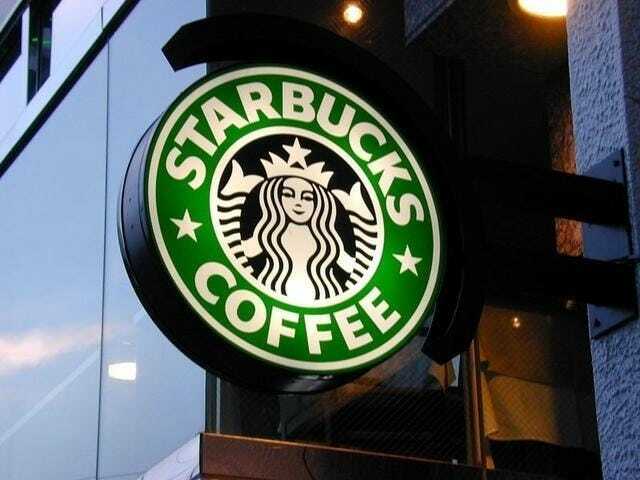 If you want free Wi-Fi, keep an eye out for a Starbucks or a McDonald’s restaurant. These two chains have a huge number of locations all over the world, and they both consistently provide free Wi-Fi. Whatever you think of their coffee and food, their free Wi-Fi is good — and you generally don’t even have to buy anything, as you can just log right in. Of course, it’s probably polite to make a purchase if you’re going to be taking up a seat and using their Wi-Fi for a while. These are far from the only restaurants with free Wi-Fi, but a Starbucks or McDonald’s is easy to spot from a distance and will probably have free Wi-Fi when you get there. Public libraries often offer free, open Wi-Fi access points, too. Cities may also host their own free Wi-Fi networks, which you may be able to find in public parks or just on the street in more active districts of the city. Even a shopping mall might offer free Wi-Fi across the entire mall. Smaller coffee shops may offer their own Wi-Fi access points. Wi-Fi is becoming more and more common — everything from restaurants to grocery stores to department stores are offering their own hotspots. Hotels may provide free open Wi-Fi networks to their guests, so you may be able to sit in a hotel lobby or parking lot and use their Wi-Fi for a bit if they don’t require a code to log on. This is becoming rarer as hotels and motels lock down their Wi-Fi networks with access codes. Many airports also provide free Wi-Fi — but many airports still don’t provide free Wi-Fi. It depends which airports you’re traveling through. This free Wi-Fi isn’t always “free” — for example, if it’s offered in a restaurant, you’ll have to buy something so you can sit in that restaurant and use their Wi-Fi. Some independent coffee shops and restaurants may require you purchase something before getting a login code. But, if you’re travelling, there’s a good chance you’ll want to stop for some food or a coffee anyway. If you’re walking down a street looking for Wi-FI, keep an eye out for the “Wi-Fi” logo sign on a businesses’ window, which will tell you whether that business has free Wi-Fi. If you want help finding free Wi-Fi hotspots, the Wi-Fi Finder app — available for both Android and iOS — can help. When you install and first run this app, it downloads a database of free and paid Wi-Fi hotspots around the world. You can then open the app when you don’t have an Internet connection and use it offline. 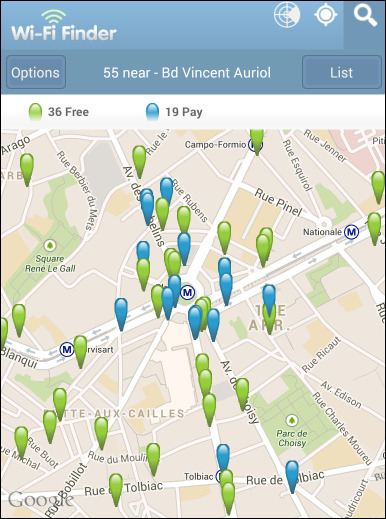 The app will use your GPS location and show nearby free Wi-Fi hotspots on a map. Install it ahead of time and launch it if you ever need a point in the right direction when you’re looking for a Wi-Fi hotspot. You can also search for a location anywhere in the world and see where free Wi-Fi hotspots may be available, if you want to plan ahead. The app isn’t perfect and not all the listings may be up-to-date, but it’s still helpful. If you pay for Internet access at home, your Internet service provider might have a network of Wi-Fi hotspots you can use. 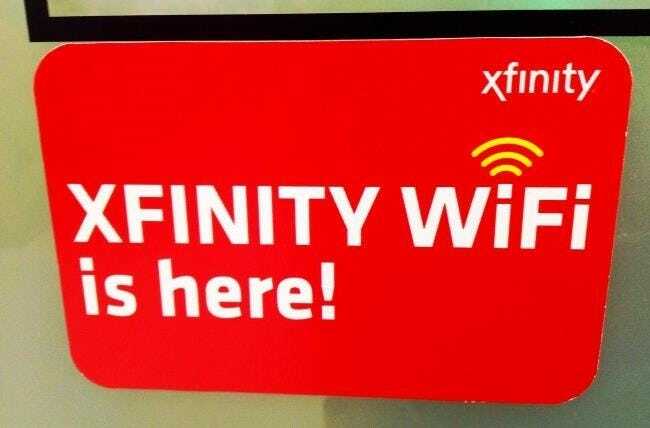 For example, Comcast has been turning its home routers into public hotspots that other Comcast customers can use. If you’re an Xfinity customer, you can log into any Xfinity hotspot and use it for free. These hotspots are becoming more widespread as Comcast rolls out routers that turn people’s home networks into public Wi-Fi hotspots. This practice is already more widespread in some European countries and other countries outside the US, so be sure to check your ISP and see if they offer a free network of hotspots for you. Of course, this only works if you’re travelling within your own country — you won’t find a network of Xfinity hotspots outside the USA. 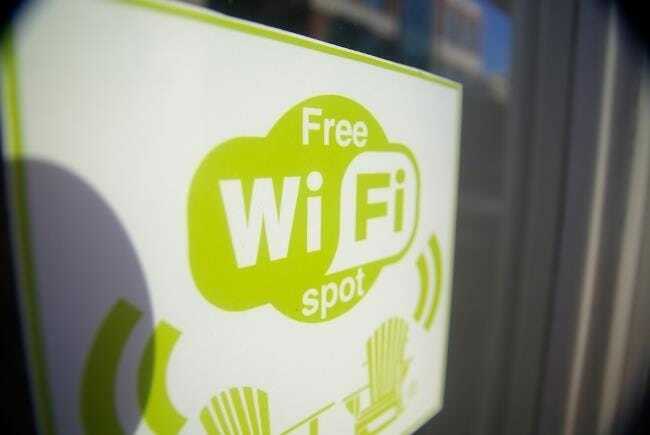 Some free Wi-Fi hotspots only provide you with a few free minutes before demanding you pay up. We’ve seen this time-limited method used at several airports. Luckily, there’s usually a way around this so you can get more free Wi-Fi time without paying. The network generally identifies your device by its MAC address, and it will refuse to offer more free Wi-Fi time to you if it recognizes your device’s MAC address. So, to get more free Wi-Fi time, you can change your device’s MAC address and then reconnect to the Wi-Fi access point. The access point should see your device as a new device and give it more free time. If it doesn’t, you may also need to clear your browser cookies. If you have any queries/feedback, please write it in comments section below OR mail me here : Snehal[at]Techproceed[dot]com. 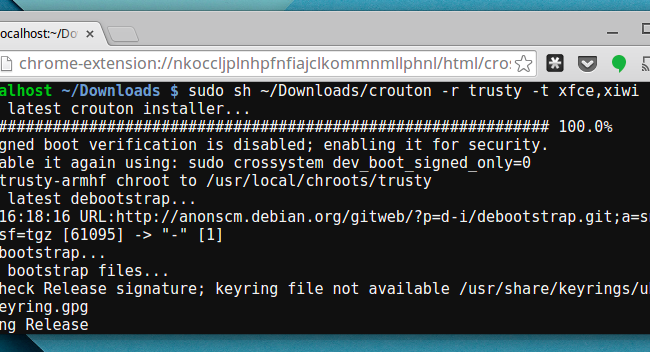 Crouton is the best way to run Linux alongside Chrome OS on your Chromebook. Now it’s even better — you can run that Linux desktop in a browser tab. This isn’t official Google software, but the extension itself was created by David Schneider, Crouton developer and Google employee. It’s as close as you’re going to get! This method requires a full Crouton installation. The Linux system isn’t actually running in a browser tab. It’s running on your Chromebook’s system as it is with Crouton. The browser tab just provides a “window” to that Linux desktop so you don’t have to switch back and forth with keyboard shortcuts. It’s a bit like VNC or another remote-desktop solution — but better. 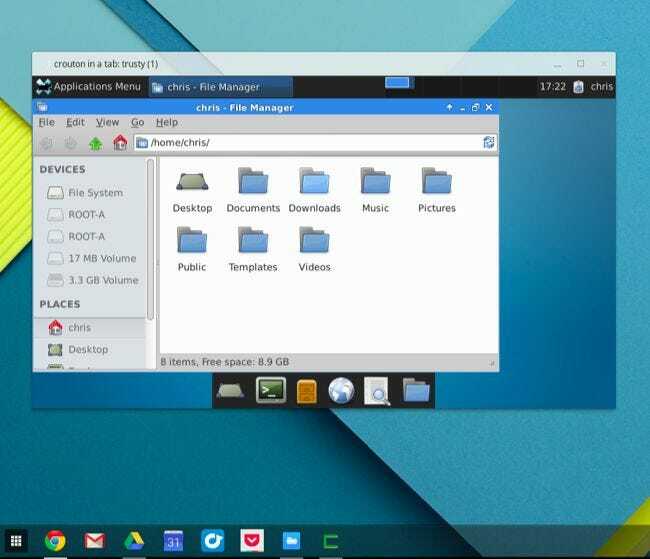 The browser tab runs software that connects to the desktop Linux system running in the background and makes it available to you in a typical Chrome OS window. This still requires the usual Crouton installation process — it just means that Linux system can be used much more easily and in a more integrated way afterwards. This method also adds a few more bonuses. Your Chrome OS clipboard will synchronize back and forth with your Linux system (known as a “chroot”) and links you click in the Linux environment can be loaded in standard Chrome OS browser tabs. First, you’ll need to have Crouton installed. This involves enabling Developer Mode on your Chromebook and then running the appropriate command to download and install the Linux desktop software you want to use. Wait a while for the script to download and install the Linux software after running the command. Provide a username and password when prompted, and check the official documentation if you need help with anything else. Your Crouton Linux system should now be installed. Typically, you’d launch it from the terminal and then switch between it and your Chrome OS desktop with specific keyboard shortcuts. That’s more convenient than rebooting to switch between the two environments, but the browser extension here makes it even more convenient. Install the Crouton Integration extension from the Chrome Web Store on your Chromebook. Next, start the Linux system by opening a shell and running the appropriate command. For example, if you installed the Xfce desktop, you could press Ctrl+Alt+T, type shell and press Enter, and then type sudo startxfce4 and press Enter. If you have a large enough screen, you could even use split-screen mode, viewing your Linux desktop on one half of the screen and Chrome OS applications and browser windows on the other half. Full desktop Linux systems open up a lot of possibilities, from using powerful developer tools and standard UNIX commands to playing games like Minecraft and the many games available on Steam for Linux. Web developers could even use this trick to run Firefox directly on their Chromebooks in a browser tab so they can see how their websites render in a different browser. Now all of it can be done right on the Chrome OS desktop without all the switching back and forth. If you're in the market for a non-root ad-blocker, developer Julian Klode has an app that you'll definitely want to check out. It uses Android's VPN system in a similar manner to alternative apps like NetGuard and AdGuard, but it's got a new twist that should save lots of battery life in the process. Unlike its competitors, Klode's ad-blocking app works at the DNS level, meaning that it only filters traffic for a brief moment when connections are first made, which is where all of the battery saving comes into play. To top that off, it's completely free and open-source, so it's an instant contender for best no-root ad-blocker. 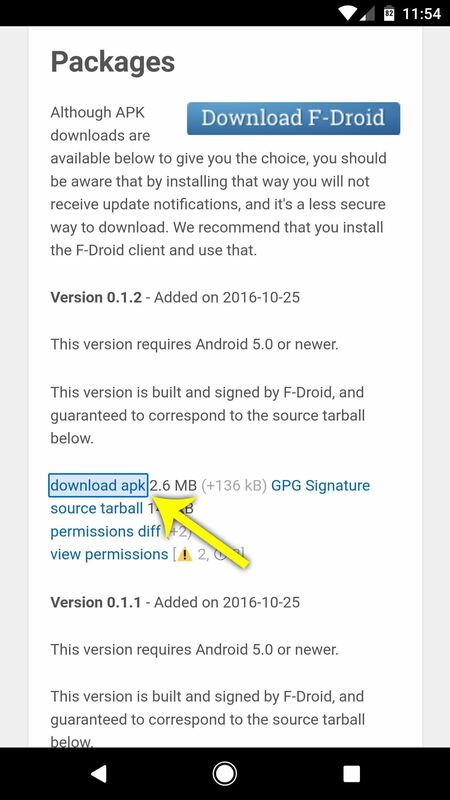 From there, scroll down to the Packages section on the page, then tap the link that says "download apk." 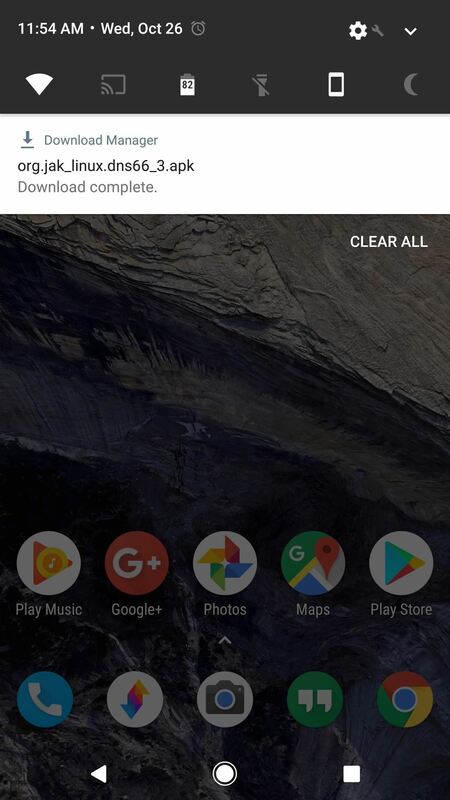 Next, simply tap the Download complete notification to launch the APK, then press "Install" when prompted. When you first launch the app, you'll be greeted by a set-up guide. Read through that if you'd like, but I'll cover the process below anyway. To start, head to the Domain Filters tab at the bottom of the screen. From here, you'll have to pick at least one ad-blocking hosts file, which is basically a list of known ad servers that the DNS66 will block for you. 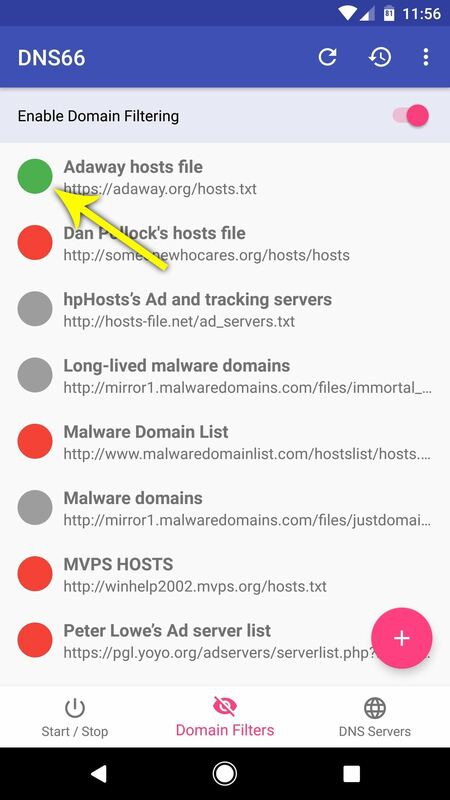 I'd recommend selecting only the "Adaway hosts file" here, and you can do that by tapping the red dot to the left of this entry. When you've successfully enabled an ad-blocking hosts file, the adjacent dot will turn green. From here, head back to the Start / Stop tab from the bottom menu, then tap the refresh icon near the top of the screen. 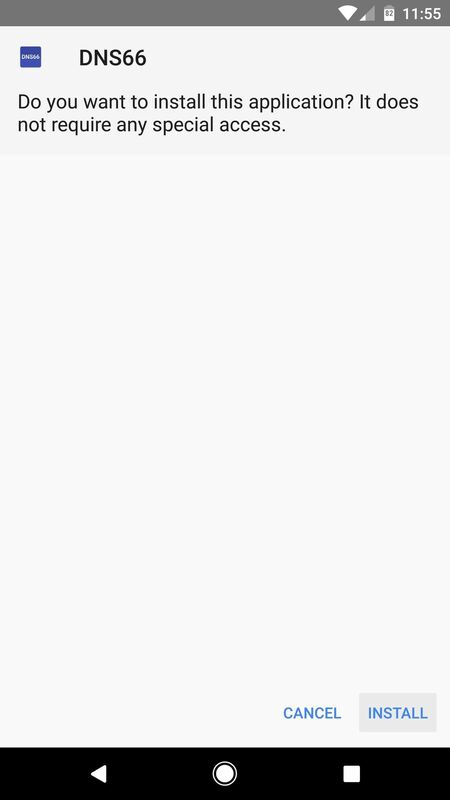 At this point, you'll see a notification that tells you the hosts file is downloading, so wait for that to finish. 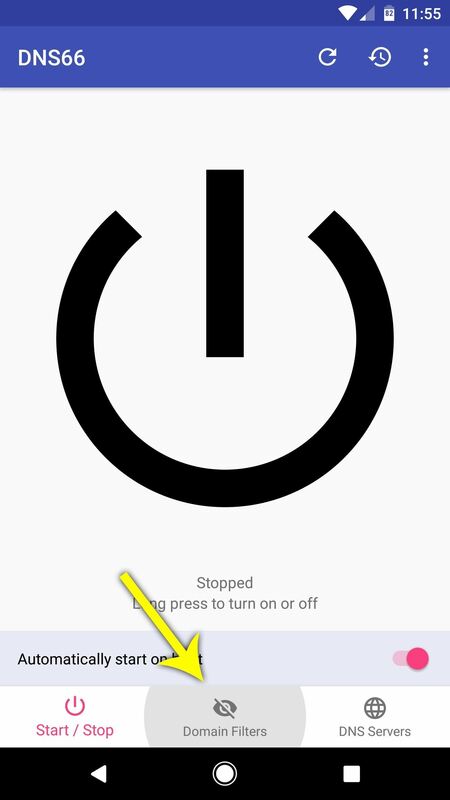 When it's done, long-press the power icon in the center of your screen to enable the VPN ad-blocking service, then press "OK" on the popup. 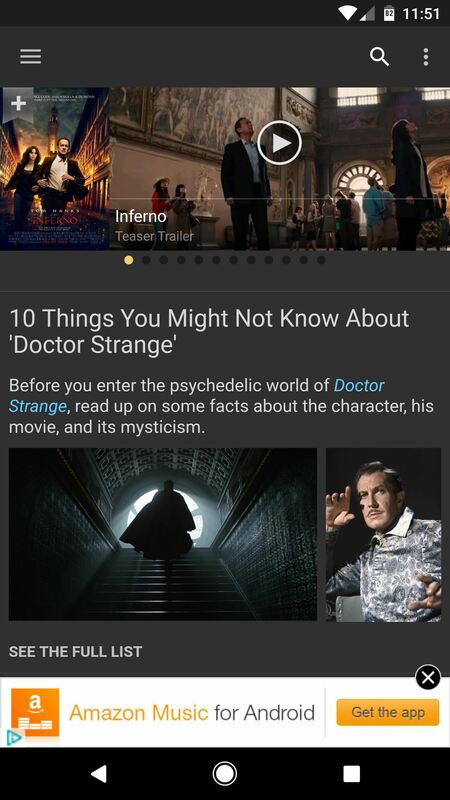 (1) IMDB app before DNS66. 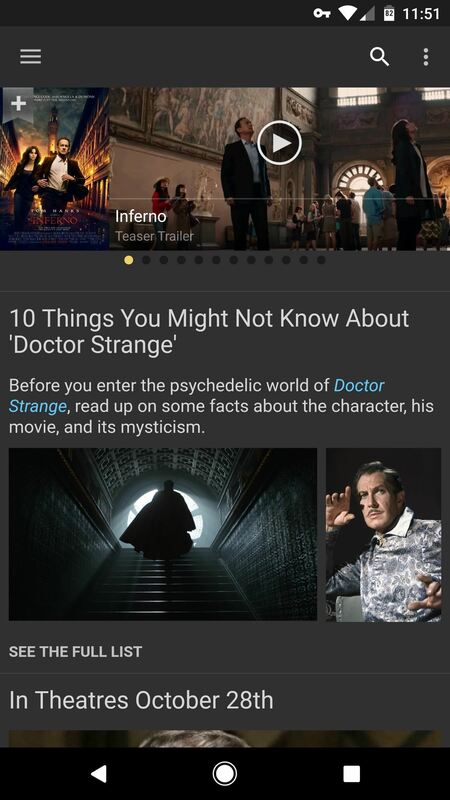 (2) IMDB app after DNS66 (note the key icon in the status bar). Unlike other VPN-based ad-blockers, DNS66 blocks ads at the DNS level. 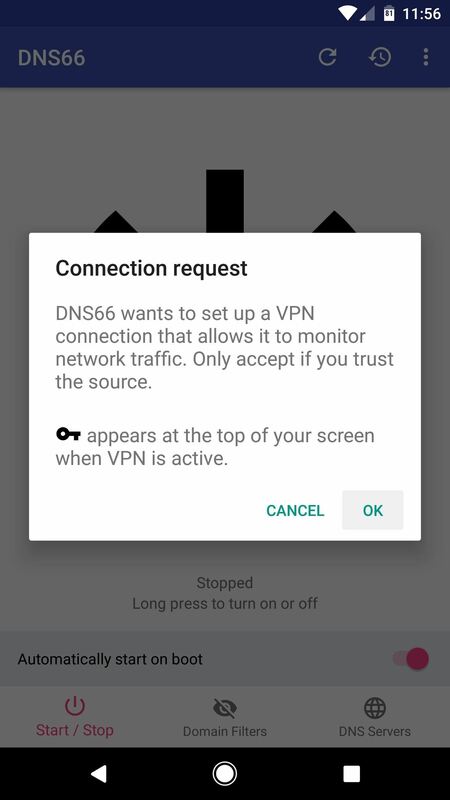 This means that only DNS traffic is redirected through DNS66 and filtered for ads, as opposed to the method employed in similar apps, which filters all data traffic for ads. 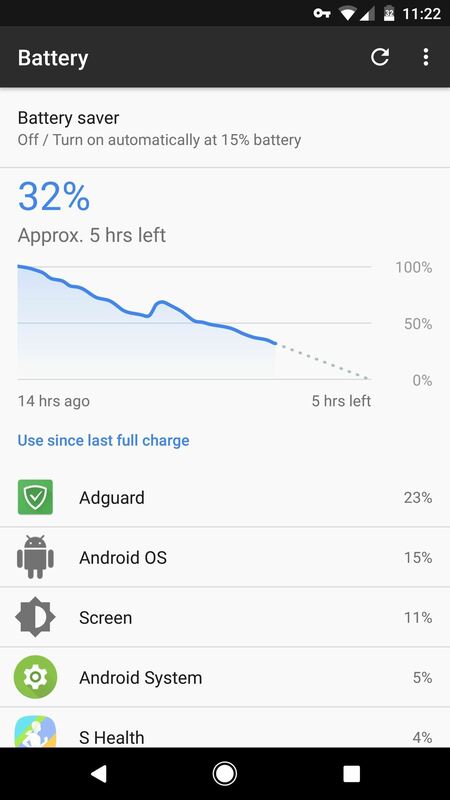 (1) Battery stats with Adguard (at the top). 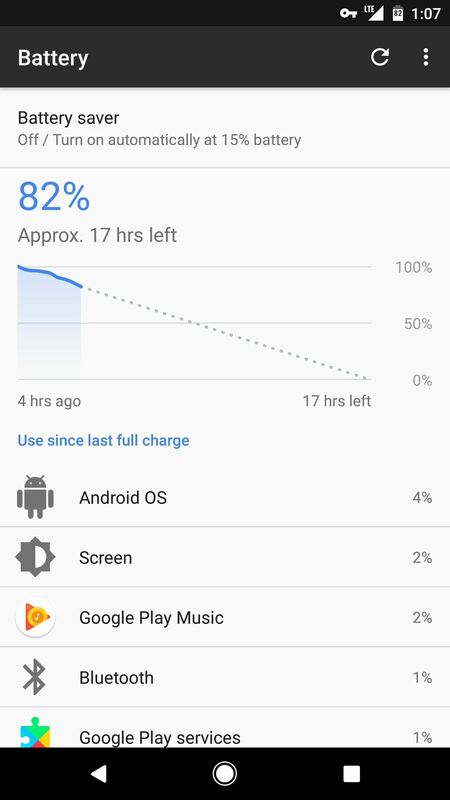 (2) Battery stats with DNS66 (not listed as a battery-draining app at all). Android Nougat is here, but it’s rolling out to Nexus devices slowly. If you still haven’t gotten the upgrade notification, here’s a little trick to upgrade sooner. 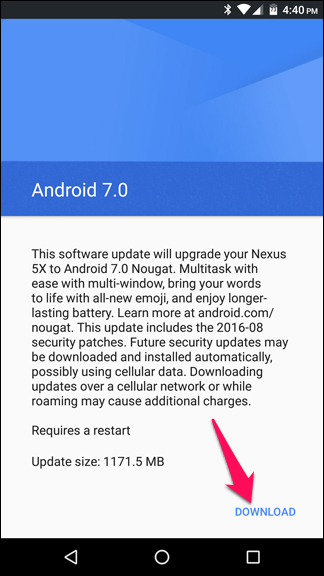 My Nexus 5X hadn’t gotten the update notification today, but after performing these simple steps, I’m up and running Android 7.0 with no hassle. 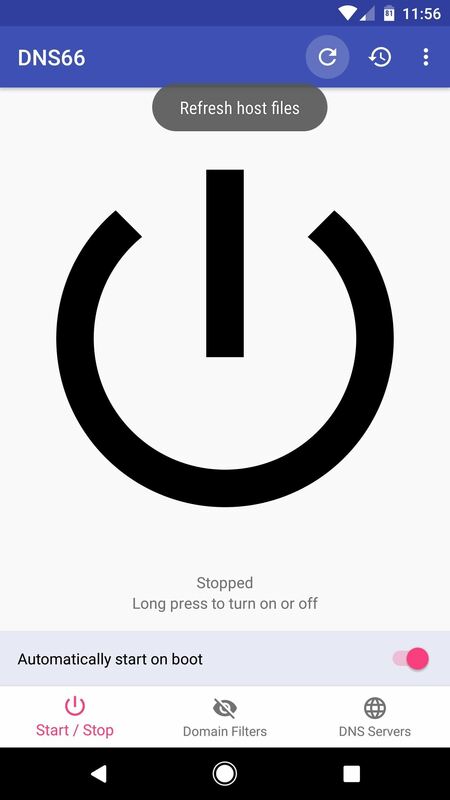 You don’t even need an unlocked bootloader. 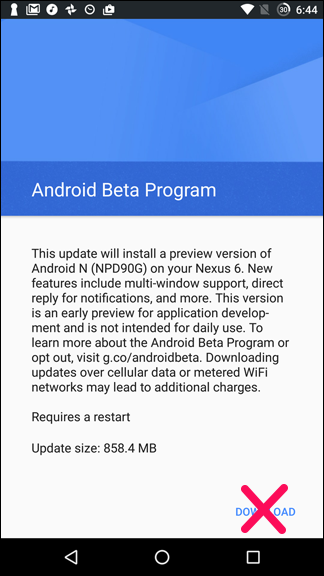 This only works for Nexus devices that are currently slated to get the update, which means Nexus 6, Nexus 5X, Nexus 6P, and Nexus 9, as well as the Nexus Player, Pixel C and General Mobile 4G. In addition, it won’t work just yet for some devices–Google has started rolling out to the 6P, 5X, and Pixel C first, and this trick should work right away. Nexus 6 and 9 users are reporting that it isn’t working yet, but once Google starts that rollout, it should work there too. This could not be simpler. First, head to this page in a web browser. If you’re logged into your Google account, you should see eligible devices in a list further down the page. Just click the “Enroll Device” button to enroll in the beta. NOTE: The page claims your data will be wiped when you opt out, but as long as you’re downloading a final build and not a preview build, you’ll be fine–your device won’t be wiped. But it couldn’t hurt to make a backup of your important data first, just in case. You should soon see an update notification on your phone (mine came almost immediately). Tap it, and you’ll get more information about the update. If you see the screen on the left, that means Google is serving a final release for your device, and you can tap the Download button to continue. If you see the screen on the right, however–which notes that the update is a preview build–do not tap the Download button. The final version isn’t rolling out to your model yet, so try again later. Give your phone time to download and install the update, and soon you should be running Android Nougat, fresh from Google’s official update mechanism. Now that you have the update, head back to the beta enrollment page and click the “Unenroll Device” button for your phone. Now that you have the update, you don’t need the beta program anymore (unless you want to keep it). Again, the page warns that your device will be wiped, but as long as you installed a final build and not a preview build, your device should be fine. That’s it! Enjoy all the new features of Android Nougat, and go brag to all your friends that you got the update first.